At first, one might wonder why the pride cycle finally ended up being so destructive. After all, one rarely thinks of pride as a major contributing factor in the collapse of nations. However, a detail in 3 Nephi 6:14 may reveal part of the problem: “there became a great inequality in all the land, insomuch that the church began to be broken up” (3 Nephi 6:14). It appears that pride led to abuse of the poor, and that this abuse of the poor led to the destabilization of the church and of society.3 As Mormon noted, “And some were lifted up unto pride and boastings because of their exceedingly great riches, yea, even unto great persecutions” (3 Nephi 6:10). The ancient conquest of Canaan may provide a parallel. According to some archaeologists, surviving artifacts reveal that when the Israelites conquered Canaan, some Canaanites joined them. These Canaanites were the poor, marginalized members of society who joined the Israelites to fight their oppressive overlords.4 For example, when the Israelites invaded Jericho, a woman named Rahab harbored the Israelite scouts, helping the invasion succeed. Ultimately, it seems that society in Canaan had marginalized the poor so much that when disaster struck (the Israelite invasion) they could not survive the blow and broke into feuding camps. It is possible that this is what happened to the Nephites as well. The pride cycle had so badly fragmented the cohesiveness of society that when the Chief Judge was murdered Nephite society could not withstand the blow and broke into tribes. Chief Judges had been murdered before in Nephite history, but the pride cycle had finally polarized society so much that it could not withstand the strain. This assassination and other injustices seem to have happened at the worst possible moment, such that it tore the fragmented country apart. In Moses 7:17–18, a group of people, the city of Enoch, were blessed by the Lord, “and did flourish. And the Lord called his people Zion, because they were of one heart and one mind, and dwelt in righteousness; and there was no poor among them.” Far from letting their blessings cause them to become prideful, this group of people used their prosperity to eliminate poverty from their society. They let their prosperity strengthen their society rather than destroying it. On many occasions, the Nephites did this as well (Mosiah 4:16–26; Alma 34:28–29; 4 Nephi 1:3), and modern readers can do the same today. 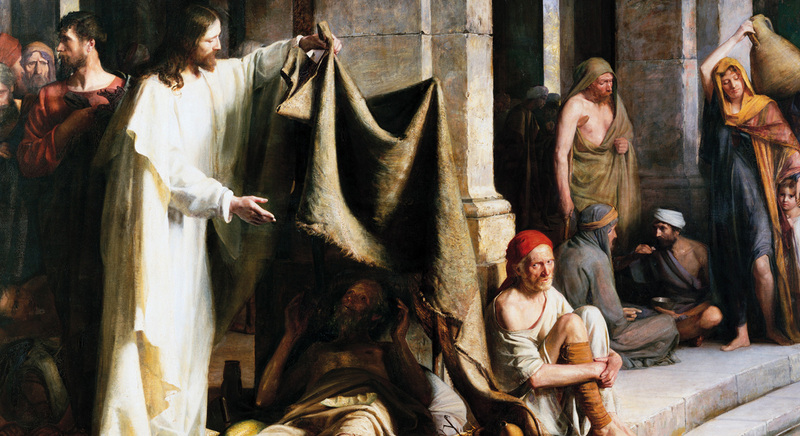 The story reminds modern readers of the Book of Mormon to avoid the pride that fragmented Nephite society and actively care for the poor and needy. Patrick Kearon, “Refuge from the Storm,” Ensign, May 2016, 111–114. Brant Gardner, Second Witness: Analytical and Contextual Commentary on the Book of Mormon, 6 vols. (Salt Lake City, UT: Greg Kofford Books, 2007), 5:280–285. Lindon J. Robison, “No Poor Among Them,” Journal of Book of Mormon Studies 14, no. 1 (2005): 86–97, 130. Lindon J. Robison, “Economic Insights from the Book of Mormon,” Journal of Book of Mormon Studies 1, no. 1 (1992): 35-53. 1. See for example, Helaman 3:25–26, 32; 11:20–21; 3 Nephi 6:1–9; Helaman 3:33–34, 36; 4:11–12; 3 Nephi 6:13–18; 2 Nephi 25:9; Helaman 7:13–28; 10:14–17; 3 Nephi 6:20, 23; Helaman 4:1–2, 11, 13; 11:1–6; 3 Nephi 9:1–12; Helaman 4:14–15, 20–26; 11:7–11, 15; 3 Nephi 5:1–6. 2. For another example of a time when the pride cycle manifested itself among the Nephites, see Book of Mormon Central “How Did The Nephites Become Weak In Such A Short Time? (Helaman 4:25),” KnoWhy 175 (August 29, 2016). 3. See Book of Mormon Central “Why Did Nephi Prophesy Near ‘The Highway Which Led To The Chief Market?’ (Helaman 7:10),” KnoWhy 178 (September 1, 2016). 4. Joseph A. Callaway and Hershel Shanks, “The Settlement in Canaan: The Period of the Judges” in Ancient Israel: From Abraham to the Roman Destruction of the Temple, 3rd Edition, ed. Hershel Shanks (Washington, DC: Biblical Archaeology Society, 2011), 59–83. This point was overstated for many years. Some scholars went so far as to state that there was no conquest from the outside, and that what some considered to be the conquest of Canaan was actually just a massive peasant’s revolt. Then the pendulum swung the other direction with people saying there was no civil unrest during the Israelite invasion of Canaan. However, most scholars now realize that an uprising of the poor against the rich was one significant contributing factor, among others, to the conquest of Canaan. For an exploration of these different approaches, see Hershel Shanks, William G. Dever, Baruch Halpern, and P. Kyle McCarter Jr., The Rise of Ancient Israel (Washington, DC: Biblical Archaeology Society, 1992). 5. The word used to describe Rahab is almost certainly not the same word used to describe the more affluent or respected prostitutes associated with ancient temples, implying that Rahab was not well off. Lawrence E. Stager, “Forging an Identity: The Emergence of Ancient Israel,” in The Oxford History of the Biblical World, ed. Michael D. Coogan (New York, NY: Oxford University Press, 1998), 103–104. 6. For how to avoid pride, see Book of Mormon Central “How Does Nephi Use Isaiah To Teach Us To Avoid Pride? (2 Nephi 15:21; Isaiah 5:21),” KnoWhy 48 (March 7, 2016). 7. Patrick Kearon, “Refuge from the Storm,” Ensign, May 2016, 111–114.